Google Analytics (GA) is a free service offered by Google that generates detailed statistics about the visitors to a website. Its main highlight is that a webmaster can optimize his/her AdWords advertisement and marketing campaigns through the use of GA’s analysis of where the visitors came from, how long they stayed on the website and their geographical position. But it can also be used to specifically track Adsense traffic, therefore helping webmasters to optimize Adwords adverts based on where visitors come from, time on site, click path and geographic location. Google analytic is a technique which shows that how the visitors found the owner’s site, and how they explored it. With this information one can do necessary editing in his website to generate more visitors to enhance return on investment (ROI). Web analytics is not just a tool for measuring website traffic but can be used as a tool for business research and market research. Web analytics applications can also help companies measure the results of traditional print advertising campaigns. 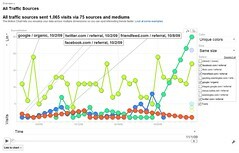 It helps one to estimate how the traffic to the website changed after the launch of a new advertising campaign. Web analytics provides data on the number of visitors, page views, etc to gauge the traffic and popularity trends which helps doing the market research. There are two categories of web analytics. Data visualization tools including a dashboard, scoreboards and motion charts, which display changes in data over time. The Dashboard and Analytical Reports: Log into Google Analytics and you’ll arrive at dashboard, the central hub that gives you an overview of all the popular reports (visitors, content, traffic sources and the cool map overlay) generated by Google Analytics. You can customize this page by changing what reports are shown, as well as dragging and dropping the reports into a format that suits your needs. Analytics and E-commerce: After you have enabled ecommerce transactions, Google Analytics will generate very detailed reports about every single transaction. By using Google Analytics with your Ecommerce website, you can gain valuable insights about your transactions, ROI, and customers. Analytical Goals: As a simplified explanation, Goals are only a page view, nothing complicated about that. If you define a goal in Google Analytics, you are telling it what page view constitutes the completion of a Goal, and Analytics then tracks it. It is an easier way to generate the reports that you need as well as a great way to measure your business objectives. Custom Reporting: Custom reports in Analytics give faster access to the information you need and less data reports to sift through. Simply, they remove the data that is relevant to you, leaving you with the bare bones reports that you need. You choose the information and metrics you want to see, organized in the way you want to see it. following are the steps which any beginner can follow for the effective usage of Google analytics. Google Analytics is a powerful tool for monitoring all aspects of your websites traffic, from referrals to search engine activity. Like any application designed to do so much, Google Analytics comes with a rather steep learning curve, which can be intimidating at first. Set up an Account: In order to use Google Analytics, you’ll need to set up an account with them. This will provide you with a unique identifier to add to your site. You can only access information about your own site; you will not be allowed access to information for other sites unless the site owner explicitly grants it to you. The only people with access to your information will be yourself, and those you give special permissions to. Access the site daily & hourly: This feature enables the site owner to access that at which hour of the day, which days of the week the site was on its peaks. So that further steps like any conversions needed should be made to get highest traffic on that particular time scales. See carefully where the traffic comes from: it helps in getting the data about from where the traffic is coming to owner’s site, whether from search engines or the links of other websites. This helps in accessing the geographical location of the visitors. It has all the features you need to improve online marketing performance. It can be integrated with your Google AdWords account. It has the ability to track campaigns from multiple sources. Motion Charts add sophisticated multi-dimensional analysis to most Google Analytics reports. Create, save, and edit custom reports that present the information you want to see organized in the way you want to see it. One of the advantages of Google Analytics is that it will allow you to view how many visitors your site is getting based on a specified time frame (from one day to all time). You’ll be able to drill-down and see where visitors are coming from geographically, whether they found you via a search engine (and which keywords they used), or whether they were referred by another website.